In a Facebook blog post today, the company says that it’s experimenting with the idea of letting non-connected users pay in order to have a message routed to your inbox instead of the “Other” folder (which most users don’t even know exists). Yup you heard that right, they’re going to let anyone bypass the “other” folder (which hardly anyone I know even knows exists) and dump a message right into your inbox. Facebook is, in essence going to someone not connected to you in any way pay to spam your Facebook Messages. 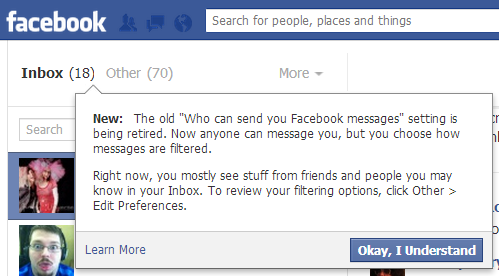 Once again Facebook is tossing any notion of privacy out the window. This has probably already taken effect on your account but unless you drill into the full Messages section you won’t see the dialog explaining it to you. Click on the message icon and then on Messages at the bottom and you’ll be shown the notification with a link to “learn more”. 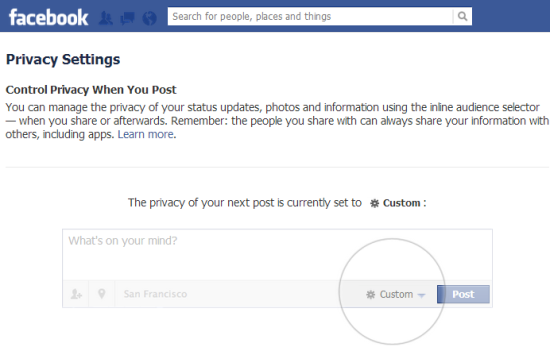 In true Facebook style they’ve defaulted the setting to Basic Filtering for you. How nice of them. 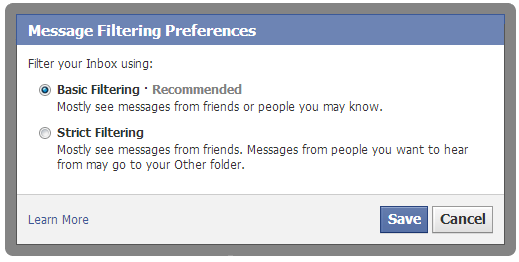 Select Strict Filtering and you’ll see mostly messages from friends in your inbox. Some messages from people you want to hear from may go to your Other folder. Facebook responded to a CNET inquiry and replied, “A Facebook spokesman said that the paid-message feature is being rolled out to a small percentage of users in the U.S. who will receive, at most, one of these messages per week. “Brands can’t use this feature — not at the moment,” he said.” Key words being at the moment.